There’s one day of the year that everyone is Irish, one day when the world is turned green and fun, and the drinks flow freely. That day, March 17th, is St Patrick’s Day of course, the celebration of Ireland’s patron saint. But over the years St Patrick’s Day has become more than a religious holiday, more than a saint’s day, it has evolved into a worldwide celebration of all the culture and identity that has led Ireland to be known as the land of saints and scholars. Legend has it that Ireland’s patron saint was in fact a fifth-century Welshman, the son of a Christian deacon who at the age of sixteen was kidnapped by marauding Irish raiders and brought back to Ireland. Patrick worked as a shepherd for six years until a vision from God told him to go to the coast where a ship would sail him home. After his escape, the young Patrick was ordained a priest and returned to the Emerald Isle to spread the word of God among the then-heathen population. He converted many to Christianity, and the lore of him having driven the snakes out of Ireland is most likely a reference to his campaigns against the pagan druids as there were never any snakes in Ireland. The shamrock is almost universally recognised as a symbol for Ireland and this can be attributed to St Patrick also. The story goes that he used the three leaves of the plant to explain to the illiterate pagans about the holy trinity of Father, Son, and Holy Spirit that underpins Christian dogma. 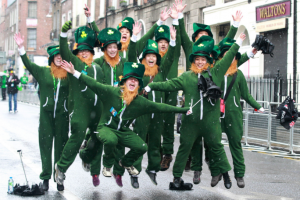 The modern tradition of celebrating St Patrick’s Day owes much to the Irish diaspora. Due to economic and political reasons, over the centuries the Irish have emigrated to all corners of the globe but have fiercely retained their identity and love of home. In fact, until relatively recently, celebrations abroad would have been larger than those in Ireland itself. Nowadays however, Dublin is the place to be for what’s locally known as Paddy’s Day. An entire week-long festival of events surround the day itself, culminating in an enormous parade through the Irish capital that includes sports teams and Celtic musicians from all over the globe. 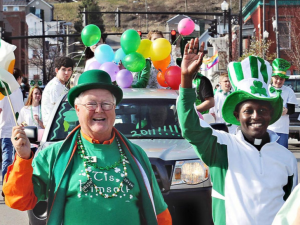 The first St Patrick’s Day parade was held in Waterford in 1903 and the tradition has grown enormously since then. What was first an event to focus on the Irish language is now a broader celebration of Ireland’s past and its multicultural future. An enormous fireworks display normally closes the festival, though this was not held during recent recession years. Though not an official holiday in North America, March 17th is still celebrated in style in the USA and Canada with enormous parades in major cities and often rivers being dyed green in tribute. New York, a city with a huge Irish influence, is considered to have one of the best parades, closely rivalled by that in Montreal. The Canadian city has a shamrock in its local flag and can date its celebration of the day back to Irish troops in 1759. 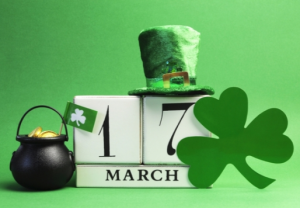 A bugbear for the Irish can be the North American habit of referring to the day as ‘St Patty’s Day’ instead of ‘Paddy’s’, but that sort of difference is easily resolved while consuming the free-flowing booze that has become synonymous with the festival. Even as far as Asia, one could expect to celebrate in style, with parades in many Japanese cities, Hong Kong and Macau, South Korea, and Malaysia. But perhaps the most exotic location for a Paddy’s Day jaunt was upon the International Space Station when astronaut Catherine Coleman played traditional Irish tunes on a flute and a tin whistle to mark March 17th in 2011. It might, however, be easier to get to Dublin for your holiday next March!